Cazenovia College's Jen Pepper, associate professor of art and design and director of the Art Gallery, took advantage of three international artist residencies during her 2015 sabbatical. In 2015, during the month of March, Pepper lived and worked near the Hardangerfjord at Kunstnarhuset Messen in Ålvik, Norway. She used the shape of the Hardanger to design a 15-foot Norwegian knitting pattern. Working with three women from the community, Pepper developed the knit work using Norwegian wool. 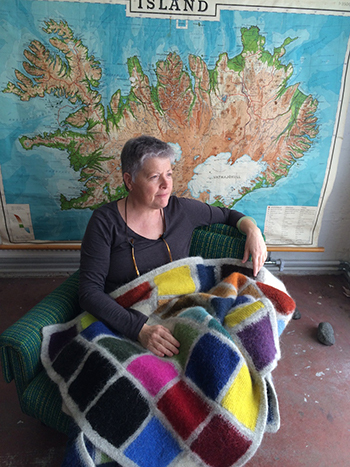 A month later, in April, Pepper traveled to Iceland where she lived and worked at NES Artist Residency in Skagaströnd, located on the northwestern coast of Iceland. There she continued her scholarly projects in writing, drawing and sculpture. She also started a new knitting project using Icelandic wool to create a knit work of an illustrated color paint chart she found in an article published in TATE exhibition catalog. The article was devoted to the development of color ranges through the ages, beginning with cave art through 20th century palettes, which sparked Pepper’s interest in this new project. 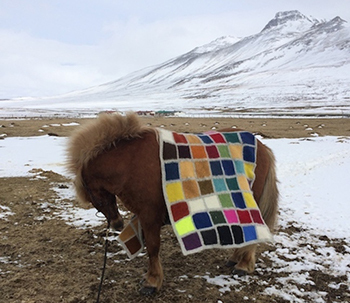 The performative project was worn by various Skagaströnd residents and even by an Icelandic horse. Her work, The Development of Color Ranges through the Ages, was later included in a Paris publication (The Skagaströnd Review, Vol. 1). In May, Pepper left Iceland to complete a third residency at Gæsteatelier Hollufgård located in Odense, Denmark, an hour away from Copenhagen. Here she continued her research and artistic practice through June. Similar to her work at prior residencies, and in collaboration with another artist, Pepper created a third performative work, Paintings Pictured Here, composed of a knitted piece using Shetland wool. The work is shaped after vernacular architecture, specifically the timber-framed barns of Scandinavia. Once the piece was completed it was worn by individuals in Denmark. An image of the final project was accepted into the Stone Canoe Journal #10, a Journal of Arts, Literature and Social Commentary, and featured as the issue's cover image.